First of all, I want to wish you all a very Happy New Year! 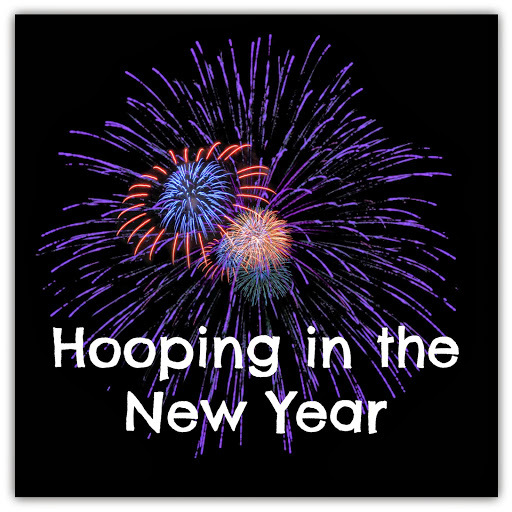 I actually did start off hooping during the first day of 2014. Deb came over and wanted to hoop in my backyard. We did for a little bit as it was pretty cold outside. Also, with an impending snowstorm threatening the East Coast, we wanted to get some hooping in before it hit. Deb did some modifications to her kiddie hoop. She stuffed it with thumbtacks to weight it down and taped it with red electrical tape. I have to say that it did work, but hoop is still too small for actual hooping, but is good for arm tricks. As for myself, I worked on the stirring the soup trick, which I learned on Monday. I have to keep my hand still and let the hoop rotate around it. I’m getting better, which is a good thing, of course. It felt good to get some hooping in to start my new year. I love seeing how Deb is taking to hooping, too. Her excitement is infectious and it’s fun to learn together.